“Like you, I died & became / English words.” The speaker of Jennifer Tseng’s Not so dear Jenny is a speaker deeply attuned to both the harm and the healing that language can do. Drawing on language from a father/phantom’s letters, the daughter/darer of these poems reconstructs adolescence, deconstructs diaspora, and gorgeously makes song out of sorrow. These poems sing and sting. A father’s appeal becomes a daughter’s appall; university morphs into universal; Diane turns out to be Diana; to remember is to “member it again / & again,” to “dream the embers of a hooded / nation into place”; and two people can and do share a face—“Every morning I see / You mourning in the mirror.” Jennifer Tseng reminds us of the power of address, the dangers and the liberations of the epistolary. This chapbook made me weep and ravenously wonder. NOT SO DEAR JENNY, published by Bateau Press, is SOLD OUT. 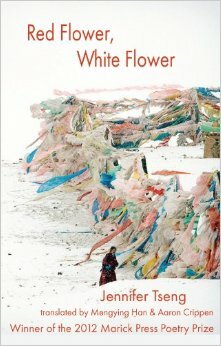 ​"The poems in Jennifer Tseng's Red Flower, White Flower have a highly intuitive use of music, serious humor, mystery, grief, and along with grief, unguarded understanding and puzzlement, side by side. 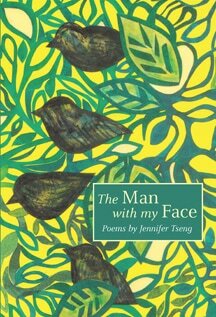 It is as if this poetry has been waiting in a room somewhere, or a river, or a forest, and now Jennifer Tseng has led us into it -- I sometimes even felt some sense of her own surprise -- all carried over with a sort of underwater intelligence, light gravity." ​"This is a book filled with 'music at once spun and wild, rough and silky': the music of appetite, of wanting and not wanting to know--The Man With My Face strives to understand what "home" is--nostos, nostalgia, nostomania--in a new language, part-inherited and part-invented, part Chinese and part American...Tseng both elucidates the ancient questions of language, immigration, foreignness, desire--the distance between lovers, between fathers and mothers and daughters--and honors their irreducible mystery..."